Check out the shirt that we came across at Universal CityWalk in the Things From Another World store. 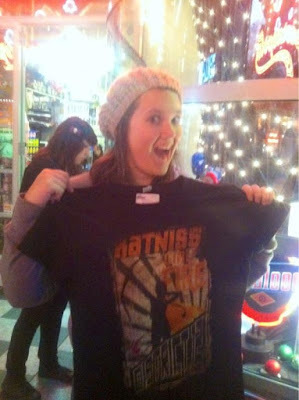 Courtney got so excited when she saw it and loved it so much that our friend Denise got it for her! UPDATE: The Things From Another World Twitter just let us know there is more HG stuff coming to their store! Welcome to District 12 gets a new layout! REGISTER for TheCapitolTour.PN! Spaces Limited! Capitol Couture Open For Business! Meet The Hunger Games Costume Designer! New Still of Effie, Haymitch, and Katniss! Drowning in Awesome Hunger Games Cast Videos! Check Out These Hunger Games Themed Decals! Check Out One of the Capitol Wigs From The Film! The World of The Hunger Games Cover Revealed! A Message From TheCapitol.PN Mayors! Hunger Games Set Visit Contest Winners Speak! The 30 Most Memorable Moments of 2011!!! Jennifer Lawrence Celebrates New Years Eve!